In a large saucepan, combine the milk and garlic. Warm the milk over high heat until bubbles appear around the edge. Remove from the heat, cover and let steep for 10 minutes. Remove and discard the garlic. Measure out 1 cup of milk and reserve; set aside the rest. In a small saucepan, melt the butter over moderate heat. Whisk in the flour and cook, stirring constantly, without browning, for 1 minute. Remove the saucepan from the heat and gradually whisk in the reserved 1 cup of milk, stirring constantly, until the sauce is completely smooth. Season with a large pinch of salt and generous gratings of white pepper and nutmeg. Return the pan to low heat and cook the sauce, whisking constantly, until it's thick, about 5 minutes. Remove from the heat, let cool slightly and stir in the heavy cream. Season with salt. Preheat the oven to 500°. Add 1/4 cup of salt to the remaining milk and bring back to a simmer. Add the pasta and cook, stirring, over moderately high heat so the milk is just simmering, until al dente, about 10 minutes. Remove the saucepan from the heat and add the ice cubes to stop the cooking. Once all of the ice cubes have melted, drain the pasta in a colander and transfer to a large bowl. Add the white sauce to the pasta and toss to coat. Transfer the mixture to a buttered 9-by13-inch gratin dish. Sprinkle the cheese all over the top and bake for about 10 minutes, or until bubbling around the edges. Turn on the broiler and broil, rotating the dish, until the cheese is golden, 2 to 3 minutes. 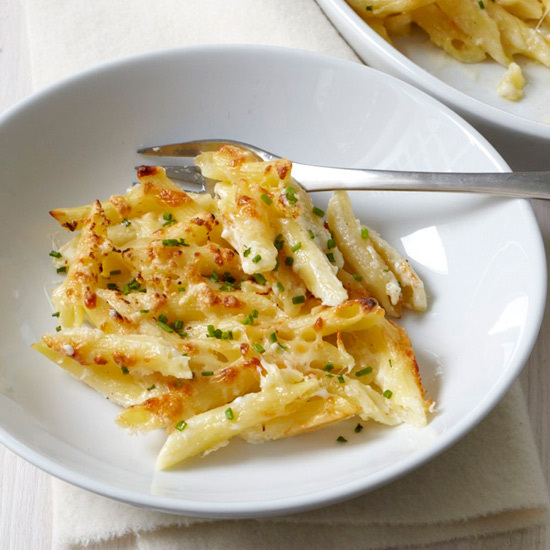 Let the gratin stand for 5 minutes, then season generously with white pepper, garnish with the chives and serve.